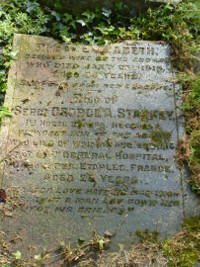 Memorial to George Starkey on his parents' gravestone at Lapley. George Arthur Starkey was born at Wheaton Aston in 1889. He was the son of Sandford Starkey, a farm labourer, and his wife Elizabeth. The family lived at various times in Lapley, Wheaton Aston and Edgland. When George was 18 he enlisted in the regular army, giving his occupation as 'labourer'. He joined the 1st Battalion North Staffordshire Regiment and was appointed Lance Corporal in 1911. At the outbreak of war, George's Battalion was at Buttevant, Co. Cork. As part of the battalion's prepartions for war service, George was promoted to Corporal. George went to France with his unit on 10th September, 1914. He had only been there a few weeks when he was wounded (gunshot wound to right arm on 14th October) while the 1st N Staffs were attacking Bailleul (about 15 km SW of Ypres). After spending several weeks in hospital in France, George was sent home. He spent several months as an Acting Sergeant with the 3rd Battalion (a reserve training unit) before returning to the 1st Battalion in Belgium on 10th August 1915. The 1st N Staffs was in the trenches at Ypres under constant enemy shell fire. Within days, George was wounded and moved to the No 20 General Hospital, Etaples, where he died on the 26th August. He is buried in Etaples Military Cemetery. Acting Sergeant George Arthur Starkey, 8952, was awarded the Victory and British War Medals and the 1914 Star with clasp. His brother's stepson, William Poston, is also commemorated on the memorial at Lapley.